The next few months are shaping up to be a busy, so I thought I’d give an update of events happening this fall. Coming right up, on Friday, Sept. 16th, is the opening for Intertwined: Needle Art of Salley Mavor at the Bristol Art Museum. Then, there will be a couple of book-signings in New England, one at the Osterville Village Library and the other at RISD in Providence (details listed below). And then, I ‘ll be on the west coast! Oct. 30th at 2:00 PM, in Portland, Oregon at A Children’s Place. I hope to meet many of you in person at these events! 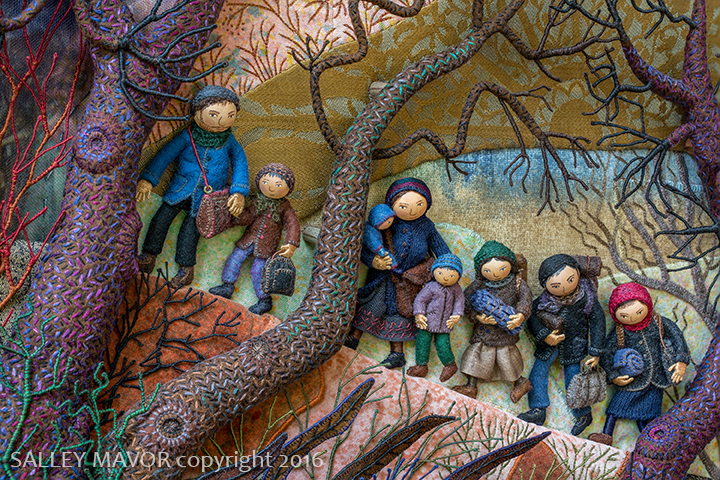 Intertwined: Needle Art of Salley Mavor ~ The exhibit will show several new pieces, including Displaced. ~~~~~~~~~~~~~~~~~~~~~~~~~~~~~~~~~~~~~~~~~~~~~~~~~~~~~~~~~~~~~~~~ Until Jan 8, 2017 ~ Salley Mavor’s artwork is in the Geometry Gallery display case at Providence Children’s Museum, Providence, RI. 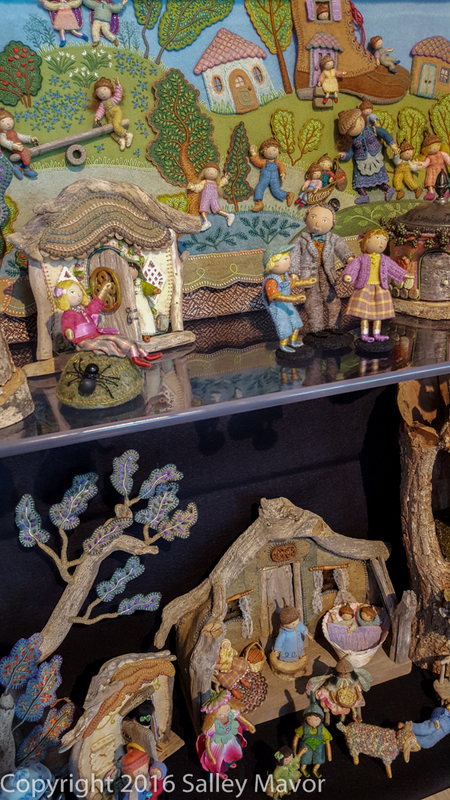 Selected wee folk dolls, houses and props from Felt Wee Folk – New Adventures, plus 2 original fabric relief illustrations from Pocketful of Posies are on display. Sat., Oct. 8, 2016 at 2:00 pm ~ RISD READS: Children’s Book Reading and Signing – Rhode Island School of Design, ISB Gallery, 1 Washington Place, Providence, RI. RISD alums Salley Mavor ’78, Stuart Murphy ’64 and Juana Medina ’10 will talk briefly and sign copies of their books. Sunday, Oct. 30, 2016 at 2:00 pm ~ Salley Mavor will talk briefly about her artwork and sign books at A Children’s Place, Portland, Oregon.